Light & bright single-level home in Rancho Bernardo! 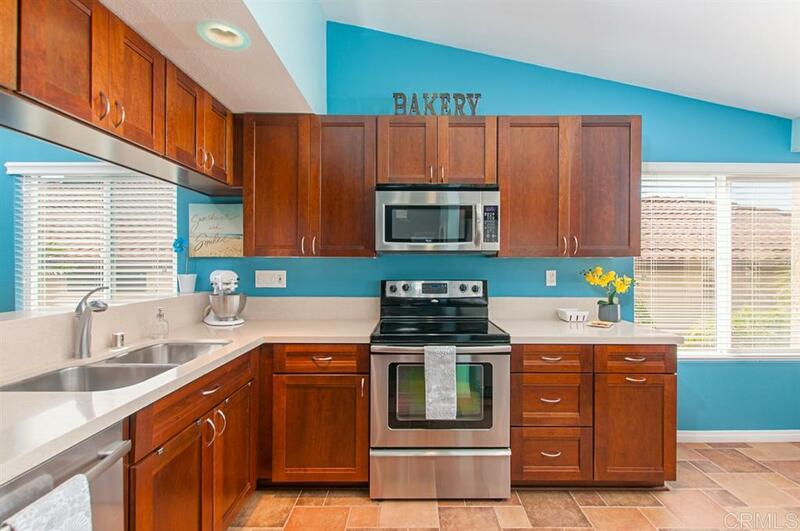 You'll love the impeccably upgraded kitchen w/ cherry cabinets, quartz countertops, S/S appliances & cheery breakfast nook. Gleaming cherry wood floors throughout, vaulted ceilings, the open & spacious living room-dining room & cozy fireplace, the upgraded master bath vanity & countertops & master closet built-ins. All appliances convey with sale. And you get to enjoy all of the privileges of the Bernardo Heights Community Center!, Relax in your own private backyard while nurturing your very own navel orange tree and maybe start that garden you've always wanted! Nestled in the heart of Bernardo Heights, you'll enjoy the resident privileges of the Bernardo Heights Community Center with a pool, tennis courts, playground and exercise facility, or you can squeeze in a round of golf at the nearby Bernardo Heights Country Club. All appliances convey, including refrigerator, and newer washer and dryer. Welcome home!